Police in Charlotte, North Carolina, released video Monday showing an officer opening fire and fatally wounding an armed man after telling him repeatedly to put his gun on the ground in the parking lot of a fast food restaurant. A judge ordered police to release the video -- captured by officer Wende Kerl's bodycam on March 25 -- which prompted the mayor and police chief to say they were bracing for protests hours before the video was made public. Both appealed for calm hours before a crowd gathered for a peaceful rally and vigil in a downtown park. The video opens with Kerl driving to the scene and a dispatcher telling her that an armed man, who at least two 911 callers had reported to police, was on the passenger side of a red Honda Accord parked in a handicapped space. She arrives to find Danquirs Franklin squatting beside the car with the door open. She and another officer approach him, guns drawn. Franklin's hands aren't visible, but both officers, standing by the Accord's trunk, say repeatedly that he is armed. "Sir, put the gun gown!" Kerl tells Franklin. Officer Larry Deal adds, "Put it down! Put it down now!" Franklin appears dazed, barely acknowledging the officers, almost as if he doesn't hear them. He focuses his attention on someone inside the car and looks down and at the car door. At one point, a bystander walks within a few feet of Franklin and the officers order her to get out of the way. After being told to drop the weapon or put it on the ground about 20 times, Franklin's right hand slowly appears and Kerl shoots him twice. Franklin looks incredulous. His words are barely audible over the commotion, but he appears to say something to the effect of, "You told me to..." before grimacing in pain, collapsing into the door and rolling on his side, onto the asphalt. The shooting sparked demonstrations last month, and CNN affiliate WBTV reported that students at a local school walked out of class to protest the killing. 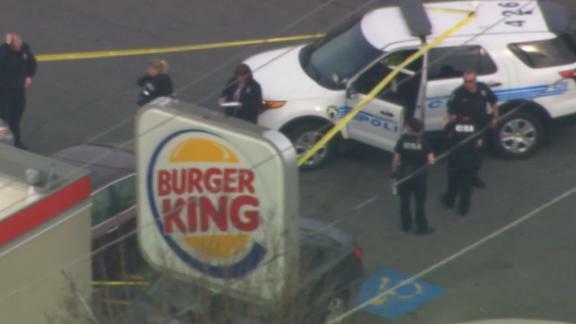 Charlotte-Mecklenburg Police Chief Kerr Putney told reporters that Kerl shot Franklin at a Burger King after the 27-year-old refused to drop his weapon. Witnesses and friends have told local media that the police statement doesn't add up and offered competing narratives, including that Franklin was trying to defuse the situation when he was shot. Before the video was released Monday, Putney told reporters, "We're preparing for the worst, but praying for the best." Mayor Vi Lyles said she has not seen the video, but she called on "all of Charlotte to come together respectfully." Officials say they're aware of protests that were already slated for this week, and the city has scheduled listening sessions Tuesday and Wednesday with residents. On the morning of March 25, employees reported that a man came into the Burger King acting suspiciously and making employees feel uneasy, Putney said. At least one 911 caller reported an armed man, telling the dispatcher, "He got a gun. He has a gun. He's pointing it at employees." The caller said the man initially walked behind the counter and tried to fight a Burger King employee. Later in the call, she is heard urging someone to lock the doors. Another caller said she was in the drive-thru when she saw a man reach into his waistband, spurring employees to run. She drove off before she could determine if he had a gun, she said. Officers arrived minutes later and engaged a man in the parking lot. After he refused to heed multiple commands to drop his weapon, Kerl, a 24-year veteran who works in the police department's metro division, opened fire, police said. "One of the first arriving officers perceived a lethal threat, fired at least one round, striking the subject," the chief said at the time. The man, later identified as Franklin, was transported to Atrium Health Carolinas Medical Center, where he was pronounced dead. A gun was recovered at the scene, Putney said. Kerl was placed on paid administrative leave. "We're trying to piece this all together. It's very early on in the investigation," Putney said at the time. The case will be turned over to the prosecutor's office in a week or so, the chief said Monday. The department's internal affairs bureau is conducting a parallel investigation. In 2010, The Charlotte Observer profiled Franklin in his quest to earn his diploma from Phillip O. Berry Academy of Technology, and the following year, reported on the young man preparing to enroll at the Art Institute of Charlotte, where he planned to study media arts and interactive media in hopes of pursuing a career in film and music. Franklin was born to a drug addict and had cocaine in his system at birth, the paper reported. He grew up with no father but enjoyed the love and support of his grandmother, who died in 2008, the paper said. His mother, who kicked her cocaine habit in 2007, gushed with pride, as did a social worker and one of his teachers, The Observer reported. "I'm done. I finished high school," Franklin told the paper. "I proved everybody wrong who said I wasn't going to make it." It's not known if Franklin attended the Art Institute of Charlotte. The protestors who gathered at Marshall Park said they were angry and sickened by the video of the shooting. They stood in a circle holding signs, including one that listed the names of other high-profile police shootings of black men such as Keith Lamont Scott, who was killed by police in a Charlotte apartment complex parking lot in 2016. Candles lined a heart-shaped chalk memorial on the concrete. Franklin's name and the words "FATHER" and "HERO" were written inside the memorial. "I don't know about everybody else here, but it was definitely traumatizing to watch that video of that black man get shot down," protest organizer Kass Ottley, said of the father of three. She told the crowd she believed Franklin "could have made it out of that situation, and he should have made it out of that situation." "So, tonight, we're here to try to find solutions, to try to come up with ways that we don't have to keep coming out to this park, year after year, after year, after year, after year, seeing the same things happen," Ottey said.